At an elevation of 1,454 metres lies the Gilgit Valley. The quaint little town of Gilgit has spectacular scenic beauty. The peak tourist season is from April to October though you can visit the valley round the year. The maximum temperature in May is 33 C and the minimum 16 C and in September, maximum 28 C and minimum 11 C.
Located on a rock near Kargah Nullah (ravine), 10 km. 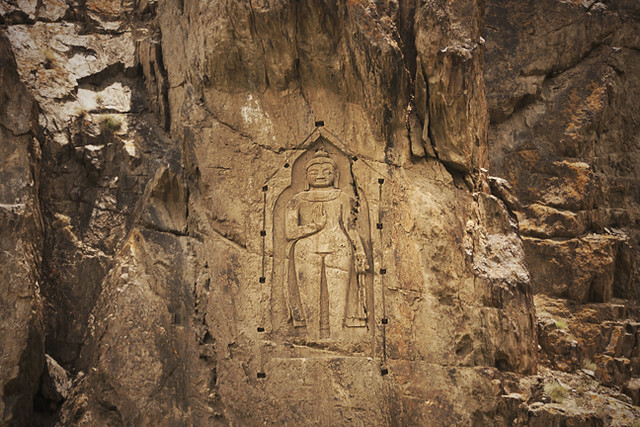 from Gilgit town is a beautiful rock engraving of Buddha from 7th century A.D.
A victory monument of Taj Mughal, built 700 years ago, is 30 km. jeep drive from Gilgit town. It is 38 km. from Gilgit – Trekking route links with Naltar valley. Trout fishing can be enjoyed in Sher Qilla Nullah and a small lake. About 61 km from Gilgit – Trekking route links with Chilas and Kohistan valley. Headquarter of Ghizer District – Ideal place for trekking, good fishing sports and duck shooting in season. It is the gateway to Iskoman Valley. Government rest house and private hotels are available (73 km from Gilgit). Archaeological sites in village and a near by village Hatoon. Two hours jeep drive from Gilgit link rod. Government Rest house, Private hotels and a Ski slope, lush green Alpine forest with small lakes and glaciers, trout fishing in lake. Trekking routes link with Iskoman, Chalt and Punial valley. The favourite sport in Gilgit is polo which local folks claim originated here. It’s more rugged, free-style version than the sedate variety known in the plains. The polo tournament held from 1st November to 7th November is a festive occasion and draws a large number of visitors. The streams and lakes of Gilgit are full of trout. 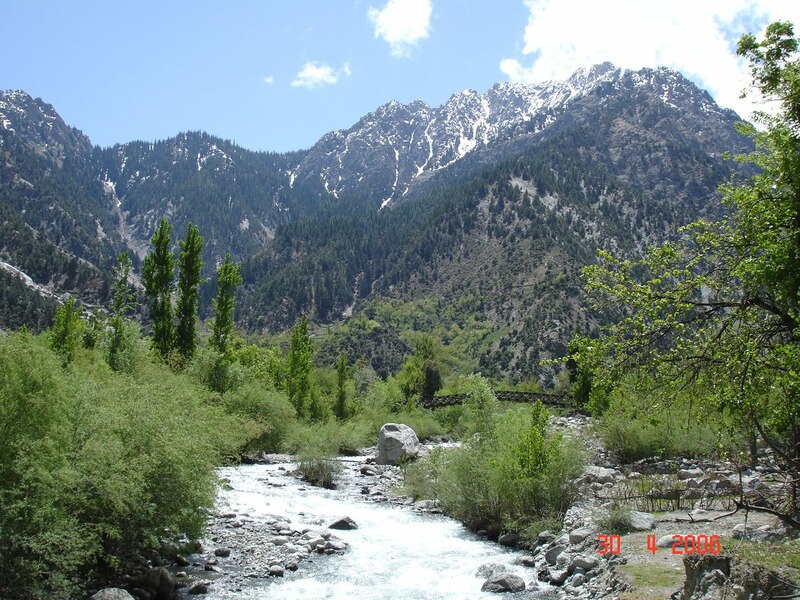 These are at Kargah Nullah (10 km, from Gilgit), Singal (61 km), Gakuch (73 km), and Phandar (117 km from Gilgit). Permits for fishing are issued by the Assistant Director, Fisheries, Government of Pakistan, Gilgit. Trekking and hiking in the rugged mountains and verdant valleys of Gilgit are allowed only in the “open zone” which extends unto 16 km. short of the cease-fire on the Kashmir border and unto 50 km short of the Afghan border. Guides are available from PTDC Motel, Gilgit. Please check for latest rules and list of treks from the Ministry of Tourism in Islamabad. Around Gilgit are towering mountain peaks, waiting to be scaled. Permits for mountaineering are issued by the Ministry of Tourism, Government of Pakistan, Islamabad. BY Air: PIA operates three daily flights between Islamabad and Gilgit. All flights are subject to good weather. The flying time is one hour and one-way fare is approximately US $ 44 for foreigners. By Road: Gilgit is also accessible from Islamabad/Rawalpindi by the Karakoram Highway. Rawalpindi to Gilgit via Swat is 704 km and takes 19 hours by bus/van; Rawalpindi to Gilgit via Thakot: 628 km. 16 hours by bus/van; Rawalpindi to Gilgit via Babusar Pass 535 km. 21 hours by jeep. Gilgit has a number of comfortably furnished and reasonably priced cottage-hotels, motels including PTDC’s Chinnar Inn, and rest houses. Tourist Information Centre, PTDC Motel, Chinnar Inn. (Tel: 05811 – 54262, 52562). 10. Qayyum Handicrafts, Airport Road. Skardu, capital of Baltistan is perched 2,438 metres above sea level in the backdrop of the great peaks of the Karakorams. Balti people are a mixture of Tibetan and Caucasian stock and speak Balti, an ancient form of Tibetan. Due to the similarity of its culture, lifestyle and architecture with Tibet, Baltistan is also known as the “Tibet-e-Khurd” (Little Tibet). It borders on the Chinese province of Xinjiang and Indian-occupied Kashmir. The tourist season is from April to October. The maximum temperature is 27 C and minimum (October) 8 C. Apart from its incomparable cluster of mountain peaks and glaciers Baltistan’s five valleys – Shigar, Skardu, Khaplu, Rondu and Kharmang are noted for their luscious peaches, apricots, apples and pears. Skardu is linked to the national capital, Islamabad by PIA, which operates one flight daily. The air journey is full of thrills and would itself be regarded as the highlight of the visit. After following the same air route, which connects Gilgit to Islamabad/Rawalpindi, the plane turns right and flies over the gorge of the Indus River. Enormous rock faces rise on either side or at times it seems as if the wing tips of the plane would almost scrape against them. They never do. Baltistan is known as the “Tibet-e-Khurd”, or Little Tibet since its life-style reflects that of the Roof of the World and the Land of Lamas. It borders on the Chinese province of Xinjiang and Indian-occupied Kashmir. The tourist season is from April to October. The maximum temperature is 27 C and minimum (October) 8 C. Apart from its incomparable cluster of mountain peaks and glaciers Baltistan’s five valleys, – Shigar, Skardu, Khaplu, Rondu and Kharmang are noted for their luscious peaches, apricots, apples and pears. The visitors to Hunza are overwhelmed by the rugged charm, the fragrant breeze singing through graceful Poplar trees and the velvet-like green carpet of wheat fields, set against the background of snow-covered mountains. This 322 km. (200-mile) long mountain hideout, nesting high in the Hindu Kush range, is a place of fascinating scenic beauty and grandeur. Chitral’s collection of rugged mountains, sulphur springs, rivers teeming with trout, orchard-dotted slopes, friendly people and annual festivals are enchanting beyond description. For the modern day traveler this scenic region offers an exciting experience. It is easily accessible by air from historic city of Peshawar. Alexander of Greece marched through this valley in 327 B.C, and left behind traces of Greek heritage, which can still be seen. Chitral District is bounded on the north, south and the west by Afghanistan and is separated from the Soviet Union by a narrow strip of Wakhan, a province of Afghanistan and from China by Hunza area. It lies between latitude 35 51 N and longitude 71 47’E. Area: 14504 square meters (5,600 square miles). Elevation: 1278-7700 meters (3700-25264 feet). Summers are generally pleasant but the winters are extremely cold. Chitral has unpredictable during spring with frequent rains and snowfall. Autumn is pleasant with mild temperatures. Ideal time for visiting Chitral is from June to September. Majority of the people are Muslims. The only non-Muslim ethnic minority in the Chitral valley are the Kafir Kalash. Numbering about 2,500 to 3,000 they inhabit Birir, Bumburet and Rambur valleys in the south of Chitral. Their life style is characterized by their own ancient and religion. The local dialect is ‘Khowar’ (Chitrali). Urdu is understood by a large number of people while Pushto is spoken and understood in Chitral and Drosh. The women wear ‘shalwar-kameez’ (long shirts with baggy trousers) and ‘dupattas’ (flimsy scarves draped round the Shoulders). In winter the man wear ‘shuqa’, loose ,long woolen gowns with long sleeves. The popular headdress is ‘pakol’ which is also of woolen material. The Kalash men distinguish themselves from the non-Kalash by wearing Chitral woolen hats to which they add feathers or little metal bells. Traditional dress, reserved for blue, very simple with a hole cut out for the neck. The wear long woolen belts and their shoes are often of goat-skins, usually rigged directly to the feet and laced with woolen or leather thongs. The Kalash women wear black gowns of coarse cotton in summer and handspun wool dyed black in winter. They also wear a picturesque headgear, which weighs between three and four pounds. It is made of woolen black material encrusted with cowry shells, buttons and crowned with a large coloured feather. (All distance are given from Chitral). The picturesque Chitral town lies on the Chitral River. Worth seeing is the Shahi Masjid (Grand Mosque) against the backdrop of Trichmir peak 7700 meters (25,264 feet), ex-ruler’s fort and the local style of Khowar houses of the friendly locals. Also worth exploring is the fascinating bazaar, which offers a host of handcrafted treasures. Chitral is famous for its polo tournaments, held from April to July and September to October. Situated at an elevation of 2,438 metres, Hunza Valley’s tourist season is from April to October. The temperature in May is maximum 27 C and minimum 14 C. The October temperature are: maximum 10 C and minimum 0 C. However, one can visit Hunza round the year. Most of the people of Hunza are Ismaili Muslims, followers of His Highness the Aga Khan. The local language is Brushuski. Urdu and English are also understood by most of people. Karimabad, the capital of Hunza, offers an awe-inspiring view of Rakaposhi 7,788 metres. The snows of Rakaposhi glitter in the moonlight, producing an atmosphere at once ethereal and sublime. The fairy-tale like castle of Baltit, above Karimabad, is a Hunza landmark built about 600 years ago. Stilted on massive legs, its wooden bay windows look out over the valley. Originally, it was used as the residence of the Mirs (the title of the former rulers) of Hunza. Hunza is ideal for mountaineering, trekking and hiking. Most of the treks in Hunza area are in open zone, for which tourists do not need any permit. However special permits are required from the Ministry of Tourism, Islamabad for mountaineering, trekking in restricted zone & climbing peaks over 6000 metres. Regular Bus and Van Services operate between Gilgit and Karimabad. PTDC Office at Chinnar Inn, Gilgit, arranges tours and transport for visitors. There are reasonably priced hotels, motels and rest houses at Aliabad, Karimabad, Passu, Gulmit and Sost including PTDC Motels in Hunza and Sost. Elevation: 1670-2309 meters (5,476-7,576 feet). Distance: 32-36km. (20-22 miles) south of Chitral. These are a group of three small valleys: Brir, Bumburet and Rambur. Brir lies at the southern most tip of Chitral at a distance of 34 km (21 miles) and is easily accessible by jeep-able road via Ayun. It is especially ideal for those not used to trekking. 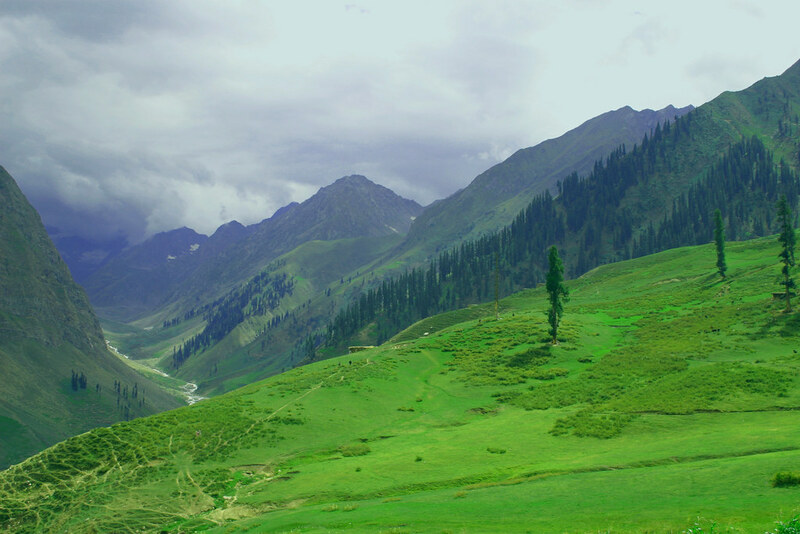 Bumburet, the largest and the most picturesque valley of the Kafir Kalash, is 36 km. 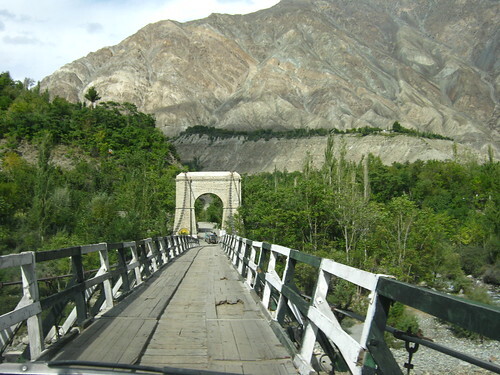 (22 miles) from Chitral and is connected by a jeep-able road. Rambur is 32 km (20 miles) from Chitral, the road is jeep-able. Foreign tourists require permits for visiting the Kalash valleys. Permits are issued free of cost by the Deputy Commissioner, Chitral, Tel: 1. Foreign visitors have to pay a toll tax of Rs.10 per person while Re. 1.00 per person is charged from domestic tourists. These valleys have an alpine climate. The people inhabiting these valleys are the primitive pagan tribes of Pakistan, who are known as Kafir Kalash, which means the wearers of the black robes. Their origin is cloaked in controversy. A legend says that soldiers from the legions of the Macedonian conqueror, Alexander, settled in Chitral and are the progenitors of the Kalash. They live in small villages built on the hillsides near the banks of streams. Their houses are constructed of rough-hewn logs and are double storeyed because of the steepness of the slopes. Kalash are very lively people and are famous for their lively religious festivals namely: Chilimjusht (spring), Phool (September) and Chowas (from 21st December for a week). 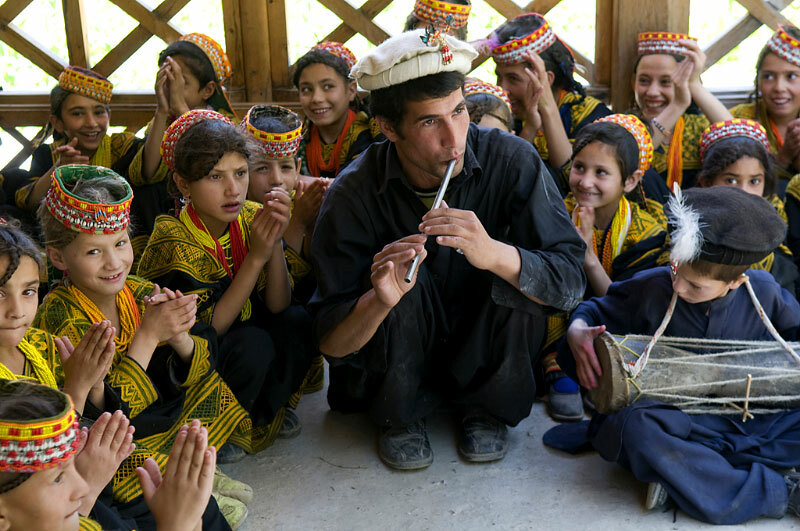 The Kalash love music and their instruments are drums and flutes. Their colorful dances impart a feeling of peace, joy and contentment. If you join them in their dance, they interpret it as a sign friendship and will open their hearts to you and reveal some of their mysteries, their joys and sorrows. You depart with a sense of poignancy and nostalgia for these beautiful children of nature and nagging fear that all the sweetness and innocence may soon be swept away forever by the power and intolerance that often hide themselves under the banner of progress. Elevation: 1859 meters (6,100) feet). Distance:45 km, (28 miles) north-west of Chitral. By jeep: hours. This un-spoilt enchanting valley of orchards, verdant fields and snow clad peaks is renowned for its boiling sulphur springs which are famous for healing effect on skin diseases, gout, rheumatism and chronic headaches. For the convenience of tourists “humans” (baths) have been constructed near the springs. Foreign tourists are requested to pay a toll tax of Rs.5.00 per person. Elevation: 2743 meters (9,000 feet). Distance: 15 km (9 miles). Worth visiting is the fairy-tale summer palace of the Ex-Ruler perched at a height of 2743 meters (9,000) feet. It offers awe-inspiring views of Trichmir and Panoramic vistas of valleys below. The fort is approachable on foot only. Chitral is the dream-come true for lovers of mountaineering, trekking, hiking, camping, fishing and shooting. There are no facilities for hiring sports gear: tourist are advised to bring their own. The majestic Hindu Kush reigns supreme over the valley. The highest peak is the famous Trichmir, which soars 7700 meters (25,264 feet) high, and is a challenge to mountaineers. There are a number of other exciting peaks too-Isltornal, Banizom, Saraghar, Naushaq, Ghocharsor, Phal, Daspar and Don rising from 6096 meters to 7315 meters (20,000 to 24,000 feet). Only experienced mountaineering. In order to avoid disappointment, foreign tourists are advised to apply well in advance for permission from the Ministry of Tourism, Government of Pakistan, Islamabad. Trekking and hiking are visitor’s favourite pastime. You can take your pick-You can either go by Jeep or Walk. There are no regular camping sites, but tourists are always welcome by the hospitable locals to camp for short durations on their lands and lawns. Before camping, tourists are requested to please get the owner’s prior permission. The rivers in Chitral are teeming with fish, especially the Lotkuh River that is famous for trout. There are also trout hatcheries in Chitral and Bumburet. Angling is allowed during the season only i.e from April to September. Fishing permits are required, please contact the Fisheries Department. The hills in the south are covered with pine, ‘deodar’ and fir forests, while the valleys are rich in mulberries, apricots, apples pears, grapes, pomegranates and melons. There are also Chinar and walnut trees in this area. Big game including the world renowned snow leopard (panthers) markhor, deer, ibex, urial, wolves, black bear and many more are found in the mountains, which are protected by the wildlife branch of the Forest Department. Among the famous birds are Chikor, ram Chikor and murgh Zarreen. There is an abundance of wildlife. In order to curb extinction, limited shooting is allowed during the specified season. Shooting of world famous snow leopard (panther), Murgh Zarreen (golden peasant) and musk deer is banned. Chitral Gol (stream) has been declared a wild life sanctuary and therefore no shooting is allowed in the area. Permits for limited shooting are required, please contact: District Forest Officer, Chitral. P.I.A. operates daily flights (subject to weather conditions) between Peshawar and Chitral. The flying time is 50 minutes and the fare is Rs 120.00 for one way. Peshawar can be reached by air, rail and road form all the major cities of Pakistan. For enquiries in Chitral, please contact the PIA Booking office, Main Bazaar, Chitral. Chitral is accessible from Peshawar by the 365.1/4 km (227) miles) long partly metalled and partly gravel-top jeep-able road, which goes via Malakand, Director and the 3118 meters (10,230 feet) high Lowari Pass which is open during the summer months only, i.e from June to the end of October and may even close earlier due to an early snowfall. Chitral can also be reached from Gilgit via 3810 meters (12,500 feet) high Shandur Pass. Permits are required, please contact Deputy Commissioner, Chitral, Tel: 1. Peshawar-Chitral 3651/4 km. By jeep-12 hours. 15 hours by jeep 250 km. (252 miles) Shandur + 5 hours on horse- back or on foot. Telegraph, telephone and postal services contact Chitral with the rest of Pakistan. There are two modest hotels, namely Chitral Mountain Inn and Trichmir View Hotel and a PTDC Motel in Chitral. The average room rent ranges between Rs. 100-400. in Chitral, Dorsh , Gahiret, Ayun, Brire, Bumburet and Garam Chashma, the rest-houses are furnished and equipped with crockery, cutlery and cooking facilities. Tourists are advised to carry their own supply of canned foods and other provisions. The ‘chowkidar’ (watchman) will do the cooking on payment. Visitors must also have there is no electricity except in Chitral and Dorsh. The remaining of the rest-houses are unfurnished and visitors must carry in addition to the above, their own sleeping bags or folding beds. To avoid disappointment it is advisable to reserve accommodation well in advance. Pakistani and continental dishes are served in the hotels in Chitral. These are plenty of fruits, especially from June to October, apricots, plums, mulberries, apples, figs, pears, watermelons and pomegranates etc. Chitral is famous for its soft hand-woven woolen material known as ‘Shu”, which is available in white black, gray and neutral colours. The best variety is made in Mogh in Lotkuh. The price ranges from Rs.20.00 to Rs. 60.00 per meter. Intricately embroidered woolen gowns known as ‘chughas’ are also very popular. Visitor’s favourite bargains also include colorful woolen rugs, exquisite embroidered household linen, bags, belts, eatch straps, shirt collars, musical instruments such as sitars, antique weapons, string bows and precious gems. 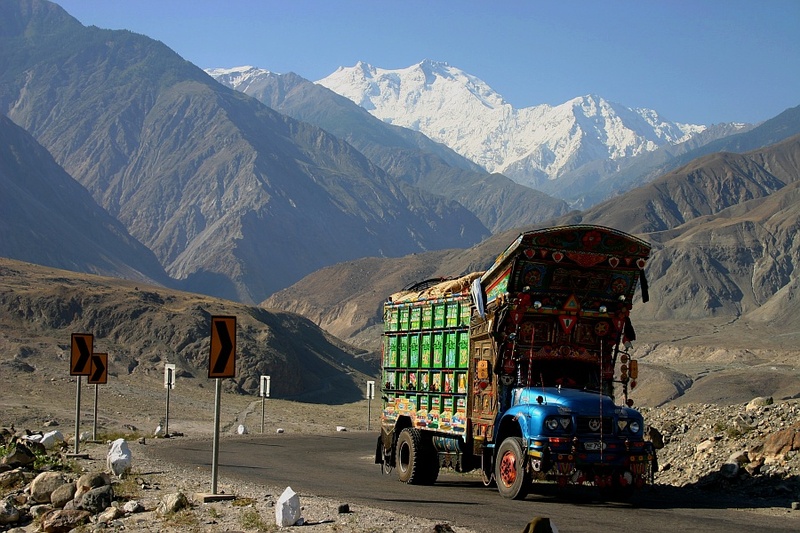 A new all-weather road, the Karakoram Highway connecting Rawalpindi/Islamabad with China’s Xinjiang Province runs through the Northern Areas. The 805 km. dual carriage metalled road starts from Havelian 100 km. From Islamabad and winds through Abbottabad-Mansehra-Thakot-Besham-Pattan-Sazin-Ghils-Gilgit-Hunza to the Chinese Frontier across the 4,733 metres high Khunjerab Pass. The road built by the Pakistan Army engineers in association with the Chinese experts and technicians has been described as a marvel of civil engineering and even as “The Eighth Wonder of the World”. Completed in 15 years, it has been forced through some of the world’s toughest terrain. The road not only opens up the Northern Areas to trade and travel but also provides easy access to hitherto closed regions, connected by jeep or goat tracks. is it worth visiting in the end December and start of January? i want to know about the weather condition in the end of december and the start of jan.
can roads are fully open. i want to go gilgit and khunjrab border. Any one (from Lahore only), interested to visit northern areas, on motorbike, after Eid ul Fitr,(end of june), please contact me on email, mclhre@gmail.com. It is very informative but my only concern is the information mentioned here about Hunza valley which is mixed with Chitral and Kelash, admin is requested to please look into this matter!